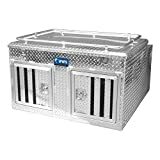 Thule UWS Dog Box is known throughout the sporting world as the finest-built way to transport and protect your valued dogs. It is beautifully done, one at a time, built by hand, sturdy enough to give a lifetime of pride to an owner. UWS Dog Boxes are available in single and double door models. The double door units feature a center aluminum wall separating each compartment. The dog box rail is a standard feature and serves a practical as well as stylish function. It is set into strong extrusions and then welded to the box, forming a secure place to tie game, coolers, or other articles! Lets your pet snuggle comfortably.